Heat oven to 375°F. In medium bowl, mix pecans, brown sugar and butter. Spread in bottom of 9-inch glass pie plate. Place 1 pie crust over pecan mixture, allowing excess crust to hang over sides. In large bowl, toss apples, granulated sugar, flour, cinnamon and nutmeg. Spoon apple mixture onto crust, packing tightly and mounding in center. Unroll second pie crust over filling; press edges together, fold under and crimp. Cut slits in several places. Place pie on cookie sheet on lower oven rack. Bake 50 minutes. If necessary, cover crust edge with strips of foil to prevent excessive browning; bake 10 to 15 minutes longer or until juices are bubbly and crust is golden brown. Cool on cooling rack 10 minutes. Invert pie plate onto heatproof serving plate. 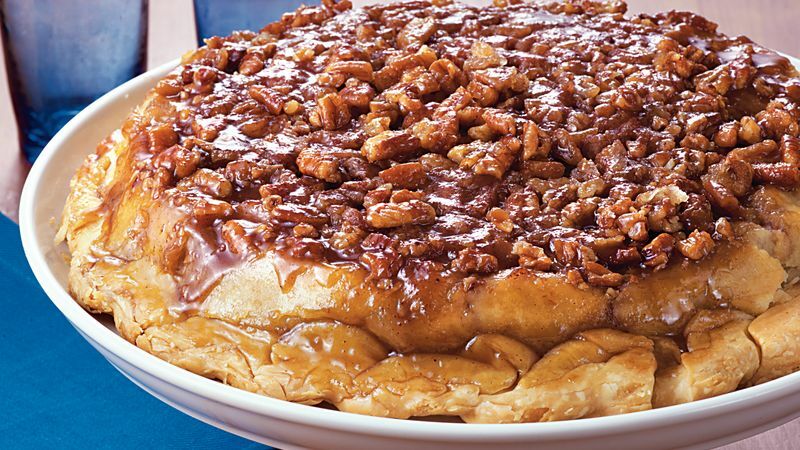 Remove pie plate; replace any pecans in pie plate onto top of pie. Cool completely.